Why are we forced to watch Alan Hansen on our screens as a Match Of The Day pundit? Kick It Out, Kick Him Out! I can't bear him anymore: to me, he represents the blunt, outdated instrument the BBC has become in these post Credit Crunch years. Not for profit; not for us either. I'm of a certain vintage so I remember him as a player, but millions of under-40's don't. Is there someone else Auntie could find with a more contemporaneous spin on the game? Point of information: Hansen retired from football before the Premier League years. Yes, he won nine league titles with Liverpool, but he wasn't considered good enough to be part of Scotland's World Cup squads either in 1982 and 1986. He was a good club player in a brilliant team. A sort of 80's Steve Bruce. Lazy and complacent, Hansen's long-institutionalised body language screams of the waged and entitled. I mean, what does he do in between Match Of The Days to justify his vast £1.5m salary a year? It looks like very little to me. But he stooped to a new low when discussing the hot topic of racism in the game: he outed himself as an equally culpable ignoranamus that our Beautiful Game is populated with at the moment. ‘If you look at 25 or 30 years ago it was probably in a bad way - not as bad as some of the other nations on the Continent - but certainly there is always, always room for improvement.’ said the 56-year-old. Starting in the Match Of The Day production offices after the show, I say. 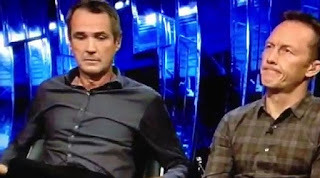 Lee Dixon, on set with him, visibly squirmed as Hansen added, ‘I think there’s a lot of coloured players in all the major teams and there are lots of coloured players who are probably the best in the Premier League. Hansen and Lawro chew the footy fat. "It's a generational thing", I'm told. "Older people I know would use the coloured word". Maybe. But here is a so-called professional broadcaster, someone who operates in a metropolitan world of all peoples. Has he not embraced any of the zeitgeist of what's acceptable? He's specialised in the nothing special for years: the BBC is a non-profit-making company; Sky Sports is - and that's no more clearly demonstrated in the differences between the quality of the pundits they use on their respective outputs. For all Andy Gray's faults, he was a hard-working, incisive pundit, schooled by TV executives to feed us football insight we weren't aware of before. Jamie Redknapp and Gary Neville are as credible and interesting as anyone on sports telly these days. Hansen's gone from asset to liability in record time. While Hansen's doubtless got some columns of support; (you can't have been on-air for that long without any), I can't imagine any justification for renewal of his contract on anything like the terms he enjoys at the moment. And I'd prefer him gone. Jonny - criticise him as much as you like for his failings as a pundit but don't ever criticise him as a footballer, he was probably the finest British centre half of the last 30 years and the fact that Scotland neglected him is partly due to their own massive failures and partly due to a policy in those days of preferring Scottish based players.... That part of the above article at least is unfair!! Jonny, criticise him for his failings as a pundit, fair enough, but don't ever criticise the bloke as a player... he is probably the finest British centre half to have played the game in the last 40 years, he was complete in every sense and made up for any failing, eg lack of pace, with an ability to read the game that was famous, and the fact that Scotland overlooked him is a testament to their failures with their unstated policies of picking Scottish based players - a totally crazy decision to favour the likes of decent but unspectacular defenders like Willie Miller and Alex McLeish, hardly Hansen's fault... Hansen was a different class and I think you're pulling a cheap shot here that demeans your own (probably fair) argument. Jonny, I have to agree with James, Hansen was a superb centre half, he did play in 82 and it was an absolute travesty he wasn't picked in 86. To compare him as a player to Steve Bruce or Gary Pallister is harsh indeed. His use of the word '...coloured' was clumsy but that was all. Language evolves all the time, but then again the NAACP still exists in its original form in the US. The punditry can be grim at times, it can be laboured and doesn't compare to what you may see in countries like Ireland or Spain. But be careful what you wish for, there are some recent premier league players who are all over our screens who may be more in touch with the modern game, but are either incredibly dull with minimal original insight - or the height of irritation. They make me switch off swiftly, and I can't really say that of Alan Hansen.